To celebrate the launch of Spring 2014 Fashion Week in St. Louis, I attended Fabric at St. Louis Public Radio. The festivities included tasty-enough-to-double-as-dinner-appetizers, a mini-video on textile production, and a panel discussion by local industry professionals on fashion's evolution in St. Louis. My nerdy side appreciated the panel's thoughtful comments, but I was totally distracted by all the fabulous outfits surrounding me. In addition to a knitwear presentation by local designers who make their own fabric, the dress-to-impress crowd put their style into overdrive. I kept seeing an innovative outfit and fervently taking mental notes, thinking, "Ooh! I've got to try that!" Not surprisingly, my fellow blogger babes rocked some of my favorite outfits. Between Jill of Stilettos on Sunday Morning's neon-inspired getup, Sarah of The Wicked Wallflower's lace bell-bottoms (I know), and Brittany of Love.Style.Transform's leather pencil skirt, my style wheels were rapidly spinning. . .
For my outfit, I went for a sugar-and-spice look with a moto jacket and pleated dress. Last time I wore the dress, I made my TV debut as a fashionista, so it's got great karma. What do you think? My tights literally stopped traffic. A woman stopped her car mid-street just to ask where I got them! Some of the birds have top hats. I can barely handle it! P.S. 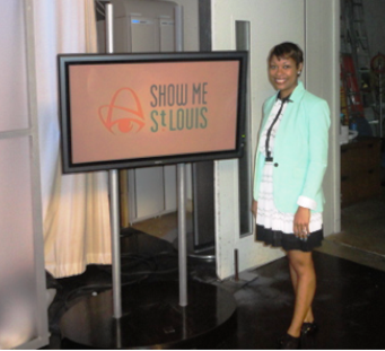 I was selected as an official Ambassador for Saint Louis Fashion Week this April! So, I'll be covering each of the events on my blog, including a sold-out presentation by designer Rebecca Minkoff. 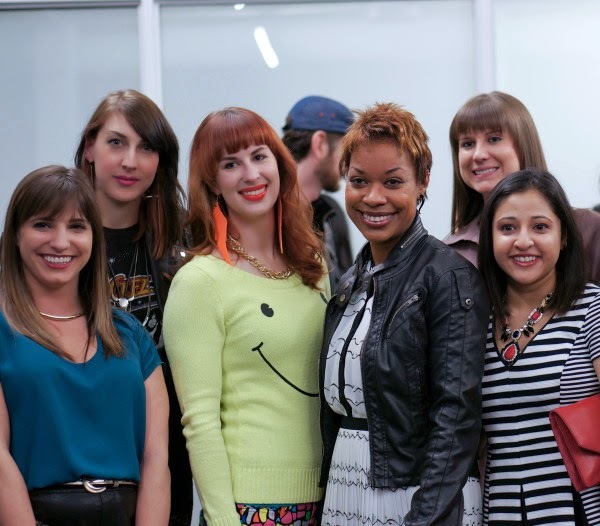 Get tickets for other shows and meet the lovely bloggers for #STLFW here. Here is a pic of some of us at the event! And yes, still dying over the birdies in top hats!!! Thanks, Jill! Can't wait to see your recap!